When you first begin your foray into the online world with your business website, on-site blog, social media accounts, and so on, what you’re going to realize pretty quickly is that there’s a big learning curve. Even though you’ve had plenty of experience from the consumer side as a frequent web surfer and social media aficionado, using these tools on behalf of your business is a completely different undertaking. That said, there is no shortage of resources to help you figure out how to get from point A to point B, and when your goal is to generate leads, you don’t necessarily have to reinvent the wheel. Here are a few tips to help you devise a successful lead generation strategy. Yes, your overall goal is to generate leads. How many leads do you hope to generate each day, each week, or each month? Are you targeting specific demographics? Are you looking for leads in your local area or are you interested in consumers across the country, or even the globe? Is quality or quantity of leads more important? How do your lead generation goals work with other goals for conversions, sales, and so on? Setting goals helps you to determine the scope of your efforts and develop an efficient and successful strategy, perhaps one that allow you to meet multiple goals through your efforts. With goals nailed down early in the planning process, you have the best opportunity to devise a productive strategy for lead generation. 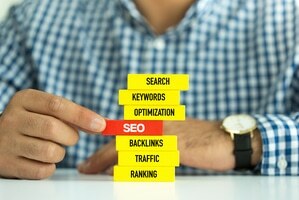 There are many goals when it comes to optimizing for search traffic. Some websites want a lot of site traffic while others are more interested in targeted traffic. Some want to build long-term relationships while others prefer to see immediate sales. If you’re looking to generate leads and go from there, your strategy when it comes to SEO may be a little different. What you’re really hoping to gain is contact information, and ideally, you want visitors to offer it up so that they’re more receptive to future contact. Your strategy should reflect this goal. Plenty of people have pointed out that the journey is often more important than the destination. However, a journey is made much easier when you have the proper vehicle to deliver you to your destination. The advertising and marketing platforms you choose as a vehicle for your lead generation strategy can have a huge impact on how you proceed and the results you produce. For example, advertising through Facebook not only gives you access to a huge potential audience, but also provides the opportunity to target very specific groups, test ads and keywords, and hone your strategy for lead generation, possibly with less expense, greater ease, and better results than more popular and established Google advertising platforms. Unless you’re an expert in SEO and/or marketing, you might need some help to formulate a successful strategy for lead generation. If you’re willing to hire experts to manage your finances and deal with legal matters, why wouldn’t you hire experienced professionals to help you devise your lead generation strategy?